Denis Diderot said of The Laundress, "[She] . . . is charming; but she's a rascal I wouldn't trust an inch." Jean-Baptiste Greuze's diminutive picture of a rosy-cheeked girl wringing out her linen was one of fourteen works that he exhibited at the Salon of 1761 in Paris. Despite its small size, it commanded tremendous attention from critics who responded to the painting's vivid color and handling, and especially to the flirtatious attitude of the laundress, with her provocative glance and disheveled appearance. 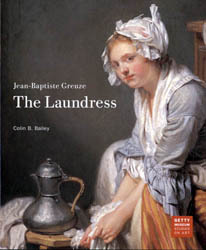 This lively and engrossing book traces the history of the Getty Museum's painting, compares the work to other laundresses painted by Greuze, and explores social mores and the role of artist's model in the eighteenth century. It provides an enlightening account of Greuze's life and times and the influences on his work.